The Lee Oskar Major Diatonic Harmonica is an awesome instrument! 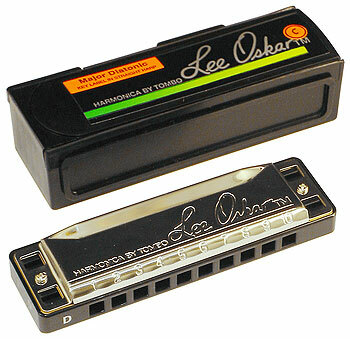 LEE OSKAR IS A ONE OF MY RECOMMENDED HARMONICAS FOR BEGINNERS & INTERMEDIATES: If you want a harmonica that makes learning to bend easy, then the Lee Oskar is a great way to go. I just tested 3 of them, and they were all highly responsive (easy to play) with a better than average tone. The most important difference is in the quality of materials, construction, design and sound. Lee Oskars are the best harmonicas in the world, and that’s not just our opinion. im looking for a low f sharp harmonica. do you know anyone who makes one. I just started my lessons today with JP, I watched all the free lessons first then immediately went out and bought an Lee Oskar Dia C. I’m excited to learn everything. So far JP I think you are the easiest to understand and love the step by step tutoring. I started your lessons yesterday and today I’m on lesson 11….already!! I’m using the Lee Oskar. Am I going to be able to learn to bend notes on this one or should I get the Hohner Special 20? Lee Oskar is a good harmonica…give it a try on bending for a bit. If you are not happy with it try the Special 20. We only play the best. I recently bought a lee oskar melody maker in c 2nd position,try as i may ,i find it difficult to play and feel a bit miffed, sorry but give me a hohner diatonic harp any day. Im just starting a friend gave me a honer silver star and a lee Oscar? The honers sound and play just as well. The lee Oscar is built so you can replace reeds? I have played Hohner and Lee Oscar. Lee Oscar seem to play easier and last longer. I would go through the Hohner Blues Harp every 6 months. I only play the chromatic harps liking Suzuki the best then Seydel and Hohner. I concur on the Special 20’s. I started your course at 69 and going stronger than ever at 71! I’m ordering the Lee Oskar and Seydel today! Thank you! You fullfilled a lifelong dream!